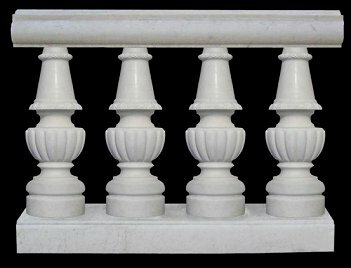 Beautiful hand carved, bell shaped balustrade system with scalloped bowl design and would look great on around your balcony, pool or front entrance. Please contact us with your custom dimensions. SKU: mb108. Category: Hand Carved Imported Solid Marble Balustrades. Tags: hand carved marble balustrades, imported marble balustrades, marble balustrades, solid marble balustrades.